We still needed ours as a very ugly bookself, though...until my recent FreeCycle Find of the Century. So now that we didn't need it for a bookshelf, I figured, "What the heck...Can you really ruin something already so ugly? 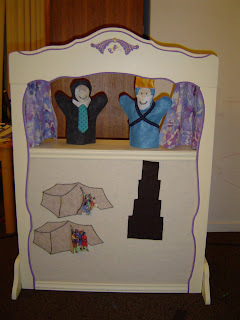 Might as well try the puppet theater out..." Of course, we really don't have many puppets in the house, but about 4 years ago I was at a workshop at church where the lady gave a really inspiring workshop on using puppets to teach children the Gospel and making scripture stories more real. I came home from the workshop really inspired...and did nothing with the ideas...until now. 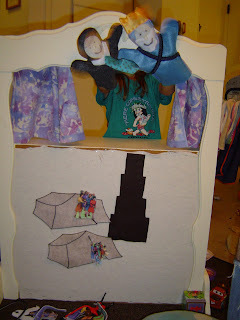 Here's our finished puppet theater!! I got a lot of help on it from my friend Patti. Patti is a great friend for a lot of reasons, but one of the reasons is she is so creative. She had ideas for almost every step that just made it so much cooler! 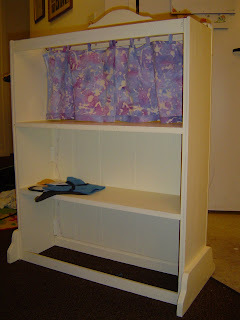 Thanks to her help, power tools, and scrap wood, we managed to do this whole project for about $1 (and that was just for the craft paint to do the curtains.) THANK YOU, PATTI!!! We started by taking the back off. All of the kids wanted to help us take the screws out. Once that was done, we traced where we would need to cut since we had the trim on the front to work around, and cut the back piece down to size to put onto the front. We put it on backward, since the front would be covered with the flannel board. 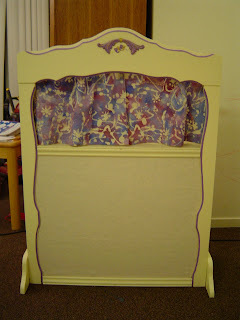 We cut just a little inside where the trim would be, so there would be room for the fabric to slip back inside. We screwed some scrap wood just behind the trim on the front for added strength and stability. 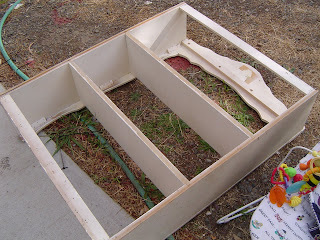 W also needed something for the sides for stability, so we cut some scrapwood up that Patti had. I'd planned to cut it straight like the example, but we were using a jigsaw to do the cutting, so Patti suggested that as long as we were going to cut it, we might as well cut it curvy. 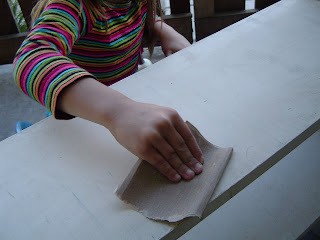 We just drew a pattern we liked, cut it out, and then used it to trace a second one. Then we screwed it on to the base. We made it stick out a little more in the front than in the back since we figured that was the direction is was most likely to tip and then we could get it a bit closer to the wall for storage. 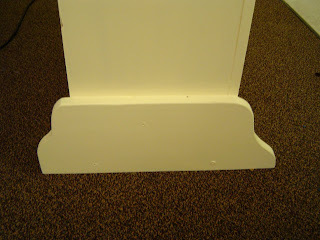 Patti also had a couple pieces of molding that we were able to cut down to size to border the flannel board. 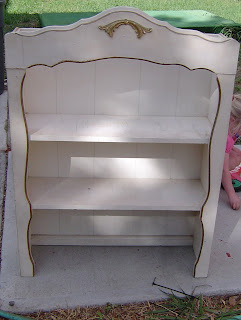 I brought it home once we'd got all the wood cut and the sides screwed on because the kids were going crazy. Once home, we sanded it. Firecracker LOVED helping with this part and it was something she could do without getting hurt and without too much supervision. We didn't sand everything off, just enough to rough it up. I'm not thrilled with the paint job, but the paint was free and since we have a super tiny apartment, it's in our living room for now, so I didn't want a super loud color. 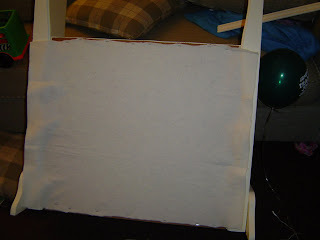 Once it was painted and the front was screwed on, I used staple gun to put the "flannel" part on. It is actually a scrap of the real cotton batting that my friend Lisa gave me. (She does some great webdesign and greeting cards.) I stapled the top and bottom first, keeping it a bit snug. 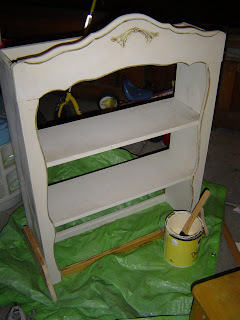 I didn't worry about this part being pretty because it would be covered up with the moulding. 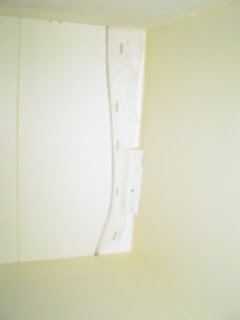 Then on the sides, I pulled it through the gap and stapled it to the inside of the moulding. Firecracker and I used this technique found on That Artist Woman to paint the curtains. I did this partly because the kids wanted purple and partly because it was a good way for Firecracker to leave her mark on the project since she couldn't help paint the structure itself as much as she would have liked. 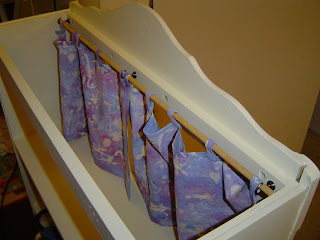 More about how we decorated the fabric for the curtains is here. We had some little hooks in the tool box that were the perfect size. 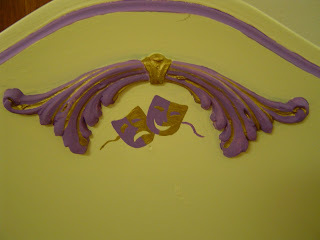 Then I painted the trim purple...because after all this is for the kids and they love purple. (Boy is actually standing in front of the puppet theater as I type this saying, "Purple, Like purple. Pretty!!) Of course it's was Patti's creative idea to put the comedy/tragedy masks on, and I think it was a great finishing touch. The kids are already loving it. We had the most success ever having Firecracker teach a Family Home Evening lesson with it last night, and Boy likes wearing the puppets around too. (Here is Firecracker doing her FHE lesson last night before the trim was painted and the molding was nailed in. They are also loving the flannel board with some flannel board figures we were given a while ago. Stay tuned for puppet posts. Very, very awesome. I'm looking forward to a command performance at our next visit! Wow. That turned out really cool. Even if it was a funky bookshelf, you're so lucky it had a good structural design (like the frilly woodwork on the top) for becoming a puppet theater. It looks much more regal this way. Great job! The puppet stage is fabulous! I'm so impressed you were able to turn a bookshelf into such a cool-looking stage. I'm sure you have hours of puppet shows to look forward to! Thanks for dropping by my blog this week! This is awesome. It looks terrific.